It’s a Ron Sproat episode today, which means that nothing really happens, and the dialogue is functional rather than decorative. Plus, it’s Thursday, so they’re really just setting up for the Friday cliffhanger. I have now watched this episode three times, trying my hardest to find something worthwhile to say about it, and it simply can’t be done. The first act is the same thing that happened yesterday, the third act is the same thing that’s going to happen tomorrow, and the second act is an entirely inert substance. It’s the kind of episode that you can recognize as being an example of the thing that it is, but it’s so ordinary that it ceases to exist as soon as the credits roll. In other words, this is the Jeremy Renner of Dark Shadows episodes. So you know how some days I manage to scrape together a blog post that’s a beautiful little slice of postmodern lit-crit poetry, with funny observations and random 1960s trivia and it leads up to a stunning insight that makes you look at the show in a new and surprising way? Well, this is going to be the other kind. I can’t even get myself worked up about this being a dull episode, because it’s a daily soap opera, and that happens sometimes. It’s just how open-ended serialized narrative works; it’s part of the ancient truce between the writers and the audience. Some days, you need to make your own fun. So there’s one thing that struck me as funny today, and I have literally nothing else to do, so I’m just going to go ahead and do it, and this is going to be the blog post where this is the thing that I do. All this preamble is basically me psyching myself up for possibly the most juvenile thing I have ever written. Here we go. 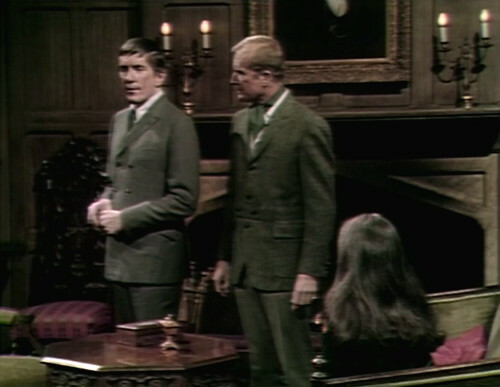 A few episodes ago, girl governess Victoria Winters woke up in the middle of the night and got herself strangled, so now Roger and Barnabas have brought her into the drawing room for a spot of gentle interrogation. Apparently, they’ve decided that it’s not necessary to call the police when a member of the household staff is savaged by unknown assailants, and I can’t blame them. I’ve seen the Collinsport police. It’s probably better to forget about them, and just try to get by on homemade justice. “We realize your throat hurts,” Roger says, “so tell us what you’ve got to say in the fewest words possible.” And right there, you can already tell that this is going to be a real barn-burner of a scene. Vicki looks down, and rubs her neck, and basically does as much indicating as she’s allowed to do without resorting to closed captioning. Vicki: Well, it happened so suddenly. I woke up, and… somebody was strangling me. Roger: Did you see this man entering your room? Vicki: No, I just felt his hands around my neck. I couldn’t breathe. Roger: Did you get a look at his face? Vicki: (shakes her head) It was dark, and I couldn’t see well. Roger: But you did see something? Vicki: Yes. A man. A very large man. Roger: And you think it was Adam? Barnabas: Are you sure, Vicki? Did you see his face? And that’s it, the one thing that I think is funny about this episode — asking Vicki “Did you see his face?” twice in less than twenty seconds. This is where I get involved. Vicki: No. I saw… a huge figure, looming over me. And then he had his hands around my neck, and so I couldn’t look up. Barnabas: (in my imagination) But did you see his face? Vicki: I tried to fight him off, but I couldn’t. Barnabas: Then you can’t be sure it was Adam. Did you see his face? Vicki says that she can’t be certain, but she doesn’t know who else it could have been. 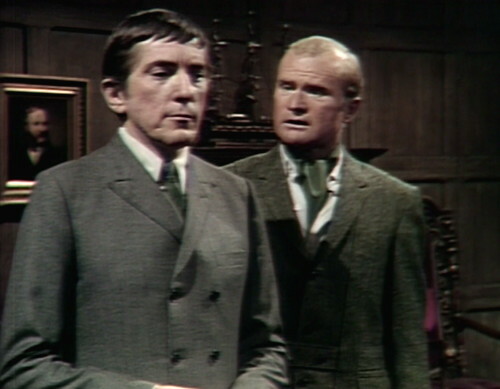 Roger: You thought it was Adam, Barnabas. Barnabas: I never said that. Roger: Well, Carolyn said you did. According to her, you thought he was the one responsible. You were certain. Did you see his face? Barnabas: I was never certain. I merely assumed he was responsible. I could be wrong. Roger: Well, did you see his face? 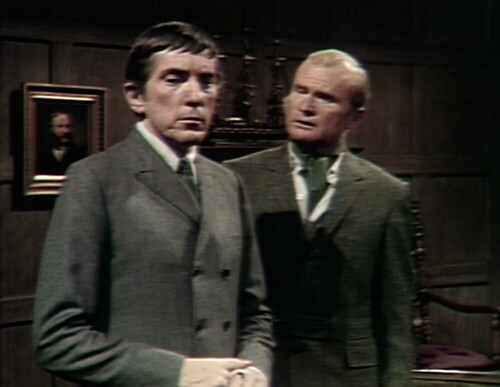 Barnabas can’t answer that, so Roger continues. Roger: Why did you come running into this house, thinking that something was going to happen to Vicki? 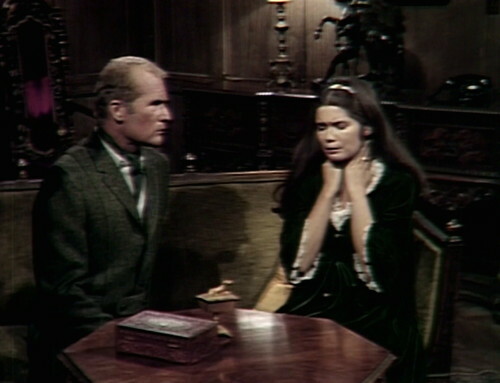 Carolyn said it was because Julia had seen Adam in the woods, heading for Collinwood. Did Julia see his face? 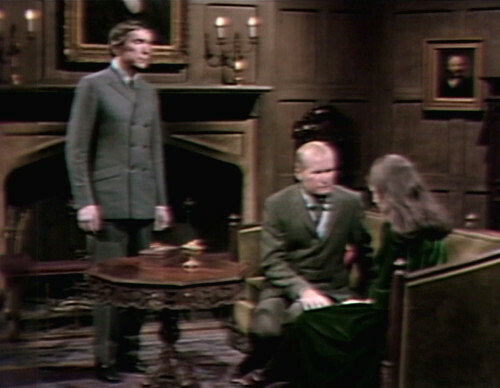 Barnabas: Well, that’s no proof that Adam was going to attack Vicki. Did you see his face? This is what I’m doing today, by the way. I am now fully committed to this concept. Roger: I don’t understand you. You seem to be defending the man. Did you see his face? By the way, Roger is really making good on the whole “say it in the fewest words possible” thing. Vicki only has two more words to say in this episode, and they’re “no” and “tired”. It was hardly worth showing up for work today. I bet she didn’t even see his face. Then Carolyn suddenly walks in, and joins the conversation. 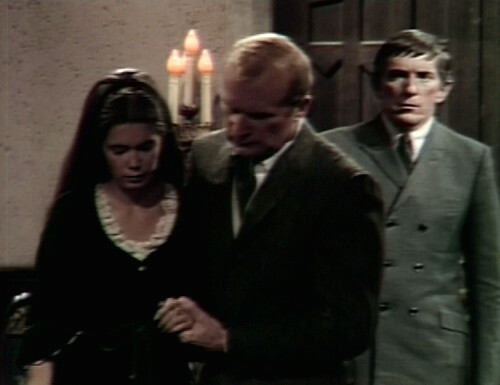 Carolyn: Barnabas is right, Uncle Roger. Roger: Carolyn! Did you see his face? So this is what I do when I’m bored; I make up silly shtick to amuse myself. And now I’ve passed my boredom on to you, and that is the circle of life. The end. I did warn you. Next: 13 Reasons Why You Should Buy “Bloodlust”. In the teaser, when Maggie says, “He brought me here, one night after I tried to escape!” — something rattles across the floor in the studio. 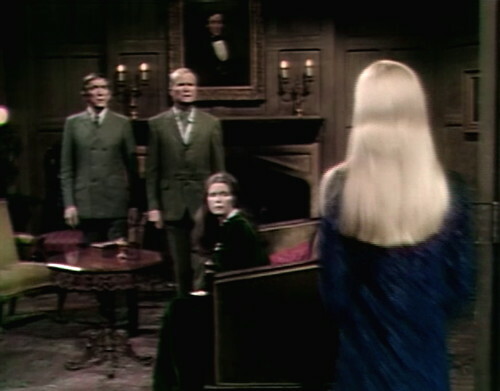 When Roger and Carolyn are standing at the drawing room door, someone in the studio coughs. 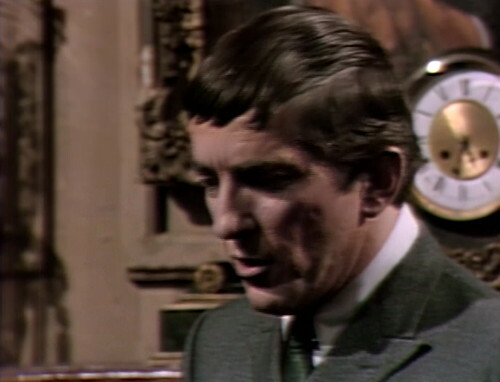 When Barnabas leaves Collinwood, the clock in the foyer says it’s 10:50; they do a big close-up on it just to stress that point. 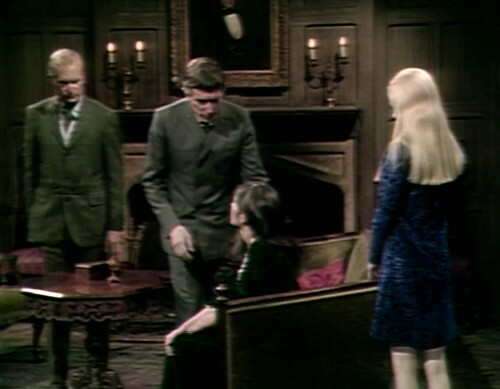 In the next scene, Barnabas has walked back to the Old House, and the clock on the mantel says 5:32. That was a hell of a long hike from Collinwood. If you were doing a podcast of today’s post, for music there’s a Rolling Stones outtake on YouTube called I Just Want To See His Face. Then again, on their second album The Doors have a song called I Can’t See Your Face In My Mind. Then there’s the Beatles song I’ve Just Seen A Face, but that wouldn’t work because Adam’s face has just not been seen, by anyone. Of course, since Adam did leave fingerprints, they could call the police, who could then take the print samples as evidence, and since Adam is the only suspect he could be fingerprinted–but because he was arrested and put in jail once before, they would already have his prints on file. But no, that story idea would just add interest and drama, and Ron Sproat would never go for that. It’s best that they just sit in the drawing room and talk about someone’s face that wasn’t seen. By the way, should Vicki be shaking her head after such a trauma to her neck? Yes will we can be safe to say nobody saw his face! Then I saw her face, now I am a believer…. 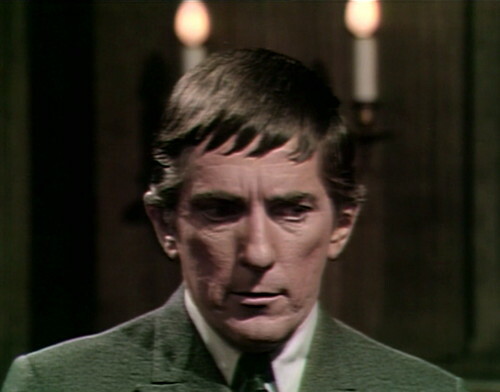 and Erid Idle as Barnabas Collins. But did you see their faces?